AEDC Executive Director Scott Unger (left) and Program Manager Anthony Durante (right) accept a grant from Carol Obando-Derstine, PPL Electric Utilities Regional Affairs Director. 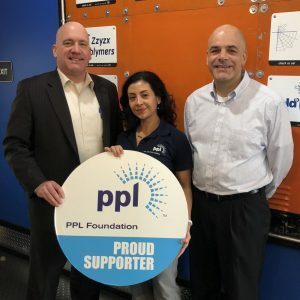 The Allentown Economic Development Corporation (AEDC) has received a $5,000 contribution from the PPL Foundation to support its economic development programs. Allentown Economic Development Corporation is an independent nonprofit organization whose mission is to improve vacant and underutilized properties within the city of Allentown. Its mission is divided into three primary activities: industrial property redevelopment and management, business incubation, and business retention and expansion. Through the organization’s efforts, AEDC has returned more than 30 acres worth of vacant or underutilized properties back onto the tax rolls of the city, reducing blight and creating local manufacturing jobs in the heart of Pennsylvania’s third-largest city. Currently, AEDC owns, operates, or manages 62 acres of property with over 1.7 million square feet of building space, Unger said. Over its 29-year existence, the Bridgeworks Enterprise Center, founded in the refurbished Mack Trucks Plant 4A in 1989, has helped launch more than 61 companies in Allentown that have created more than 618 jobs. Today, ten early-stage manufacturing companies call the AEDC business incubator home, along with several microbusinesses and independent professionals who occupy the building’s Flex Office & Coworking space. The business retention and expansion programs of AEDC are aimed at ensuring that the existing manufacturing companies in Allentown have the resources they need and an advocate representing their interests across the various organizations and service providers in the region. AEDC manages $3.655 million in funding across four loan programs on behalf of the city: the Pennsylvania Minority Business Development Authority, Enterprise Zone, Allentown Development Company, and the City of Allentown Economic Development revolving loan funds. Additionally, AEDC staff members visit several manufacturing companies each year as a means of “keeping a finger on the pulse” of what’s happening in the local economy, Unger said.